LOVELY MOSASAUR JAW - CRETACEOUS MOROCCO. LOVELY MOSASAUR JAW - CRETACEOUS, MOROCCO. Halisaurus arambourgi Bardel et al. 2004. 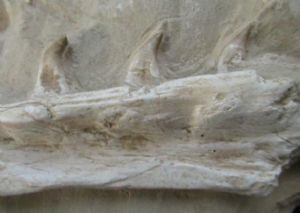 Fine well preserved 3D Mosasaur jaw on matrix. This is the front two thirds of the jaw. Still has 7 of the sharp pointed teeth in position. Halisaurus was a medium sized marine predatory reptile that fed primarily on fish. This jaw is 100% natural with no repairs, filler or restoration whatsoever. Beautiful display piece. Grand Daoul district, Khouribga, Morocco.